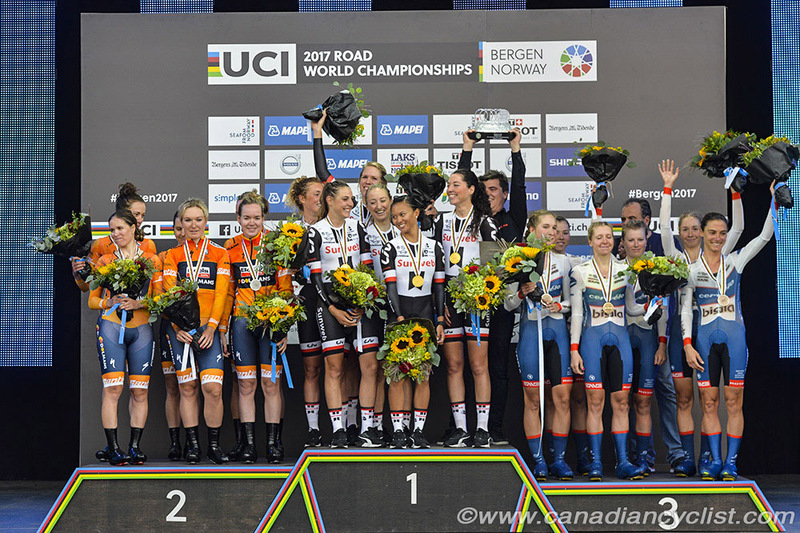 Canadian riders got off to a good start on Sunday, the opening day of the Road World Championships in Bergen, Norway. 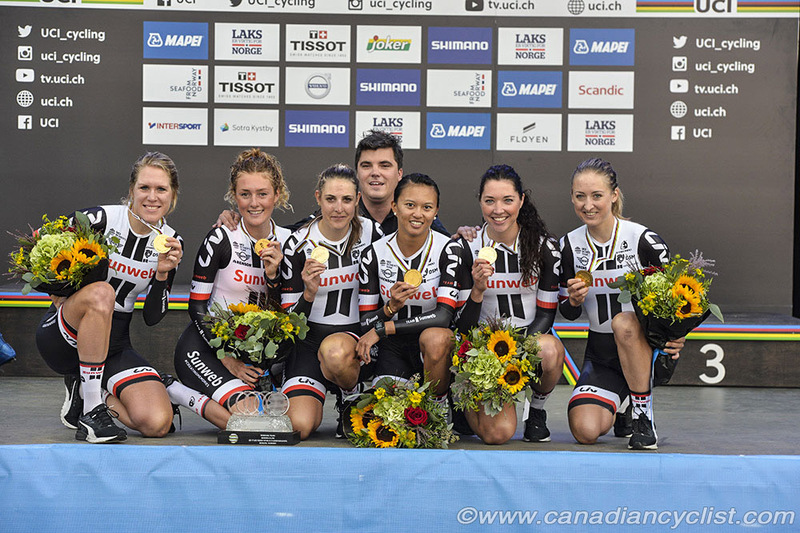 Leah Kirchmann was on the gold medal winning Sunweb squad for the women's team time trial, while Karol-Ann Canuel won silver with the Boels Dolmans team. In other Canadian results, Alison Jackson was eighth with BePink, and Svein Tuft was fifth in the men's race with Orica-Scott. The team time trial is the only trade team event at the Worlds, and both women's and men's teams raced 42.5 kilometres. The course was technical and demanding, with narrow, twisty roads, cobblestone sections, fast descents and one extended climb. Team Sunweb seemed to get stronger through the race, while other teams faltered. Cervelo-Bigla set the early fast splits, to be overtaken by the final starting team - Boels Dolmans, the defending three time champions. However, Sunweb came to the forefront in the final kilometres to win with a time 55:41.63, 12.43 seconds faster than Boels Dolmans, with Cervelo-Bigla at 28.03 seconds. "For sure, coming into this Boels was the favourite," agreed Kirchmann. "We knew we could fight for a podium spot if we rode a really good race, but we didn't expect to win. It's pretty cool to be a world champion. Our strategy was just to pace the whole race; not go too crazy right off the start and end up losing time at the end. We knew that the times were close from communications we were getting, but in the end you just have to ride your own race."